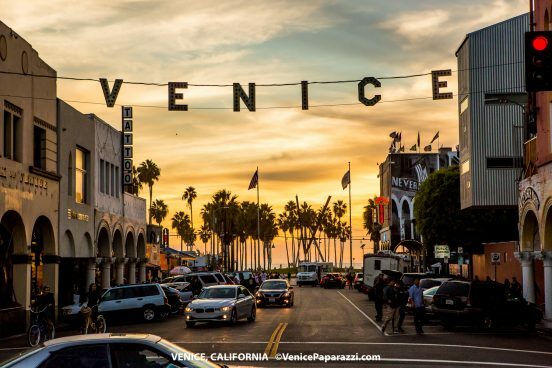 SUGGESTED ACTIVITY: Take a selfie or portrait with the iconic Venice Sign! Join the global club of folks who have a photo with Venice’s most recognizable back drop, The Venice Sign. Wait at the traffic light until the walk signal appears, then run out in front of the sign and strike a pose! You have about a 30 second window to get your shot before the cars start coming. Tag it, Post it, Share it! @VeniceSign, @VeniceBeachFun. Enjoy! Location: 80 Windward Ave. Venice, CA 90291. Metered parking on Windward Ave. Parking lots on Windward Ave and Speedway. The 5th Annual Venice Holiday Sign Lighting.